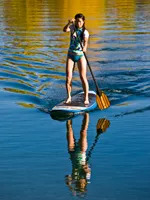 This past Saturday evening I found myself balanced on a paddleboard in the middle of Burlington Bay on Lake Champlain. The water was still, its depths blue-green and seemingly bottomless. As the sun sank lower, casting its golden pink rays over the Adirondack Mountains across the lake, the rhythmic splish-splash of my paddle kept time with the faint music floating across the water from a beach-side festival. It was, in short, a little piece of heaven. For anyone who hasn't heard of paddleboarding (also known as paddlesurfing), it basically boils down to standing on a big surfboard while doing canoe-style strokes with a super-long paddle. I'd been longing to try it for months—why should celebs like Michelle Williams, Jennifer Aniston, and Kate Hudson have all the fun?—but Birmingham, Alabama, isn't exactly a hotbed of aquatic activity. So as soon as I nailed down the dates for my family's annual summer Vermont vacation, I got in touch with Jason Starr, owner of PaddleSurf Champlain, to set up a lesson. We started out on terra firma, practicing the three basic strokes—forward (for, well, moving forward), sweep (for gradual turns), and reverse sweep (for quick turns). Once Jason was confident I had those down, it was time to conquer the lake. Initially, he had me kneel on the board, allowing time to get used to balancing while paddling with added resistance from the water. Once I felt relatively comfortable, I carefully got to my feet. Talk about core engagement! While the waves seemed to be as firmly on vacation as I was, I still needed to keep my whole middle section strongly engaged in order to stay upright. The muscles in my legs and feet were clenched just as tightly as I tried to balance the need for strength in my strokes with my fervent desire to not fall off the board and lose my favorite hat. I inched forward. Jason, clearly as at home on the board as a wizened mariner at the helm of his most seaworthy vessel, stayed gamely nearby, suggesting helpful tweaks—a more circular stroke here, a straighter arm there. We had just practiced a turn back toward the shore when a motorboat passed behind us, churning up a brief series of waves. My board began to pick up speed as it rode the mini-swells, and the feeling was so delightful that I forgot I was a beginner and began to relax. And, lo and behold, it all became easier after that. My strokes became more confident, my balance stronger, my progress smoother. I found myself gliding along, chatting easily with Jason as our boards kept pace. How can I describe what it was like, to be out there in the middle of the bay? It felt different from being in a kayak or a canoe, like I was pulling a fast one on Mother Nature by skimming over the water as if standing on Aladdin's flying carpet. A whole new world, indeed. The hour passed far too quickly. As we headed back toward the beach, a seagull flew by in the opposite direction. I envied him.